The ‘A’ House in Kisami is a private retreat overlooking the ocean at the southernmost tip of the Izu Peninsula, about 180km south of Tokyo. Located at the end of a tiny mountain road leading up a coastal hill, the site is on a steep slope with stunning views and sounds of the sea. A young couple, both outdoor enthusiasts, asked for a simple retreat set in the outside that would give them and their children a stark contrast to their daily lives in downtown Tokyo. With most of the site sloped at 30 degrees and less than a tenth flat, the project started with carving out the mountain. Placing a small volume into the resultant trapezoidal carved-out void, and a larger one on top turns the mountain void into the centre of the house: a spa zone in the mountain between the platonic volumes housing bedrooms on the lower and living on the upper level. When the spaces in-between become the building’s essence, it is hard not to realise that architecture is not about objects. 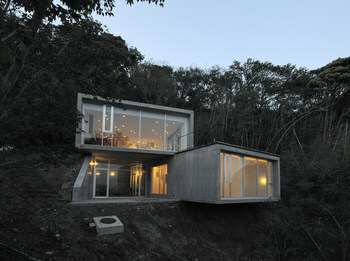 The built only frames this essence: the exterior space that flows through the building, down the mountain and connects the A House with the sea.